Here is all the practical info for your groups coming to see this major event! In 2019, the Festival of Lights will take place during 4 days, from December 5th to December 8th. In 1643, the échevins (the town’s municipal councillors) sought the protection of the Virgin Mary by vowing to bring her offerings in a procession every year on the 8th of September (the day of the Nativity of Mary) if she protected the town from the plague epidemic that was devastating France. Lyon was spared and the custom is still observed every 8th of September, when the Vœu des Echevins (‘Vow of the Echevins’) is commemorated. In 1852, local sculptor Joseph-Hugues Fabisch was chosen to sculpt a five-metre tall gilded statue of the Virgin Mary, which was to be placed on the chapel of Fourvière Basilica on the 8th of September. However, the river Saône broke its banks and flooded the sculptor’s workshops, delaying the inauguration until the next commemoration on the 8th of December the following year. On that evening, the festivities were cancelled due to a storm, but the locals placed lumignons (small lanterns) on their window ledges as a spontaneous sign of worship. Since then, the 8th of December has been the day of the illuminations, which became the ‘Fête des Lumières’ (Festival of Lights) in 1999 and now takes place over a four-day period. Is the programme the same on all four evenings? The shows are the same on all four evenings and are looped, from the beginning to the end of the festivities. They last around ten minutes each. The 8th of December is a special evening, as it is the traditional and historic day that gave birth to the event and it is possible to watch the montée aux flambeaux (a procession during which people carry small lanterns up to Fourvière Basilica). 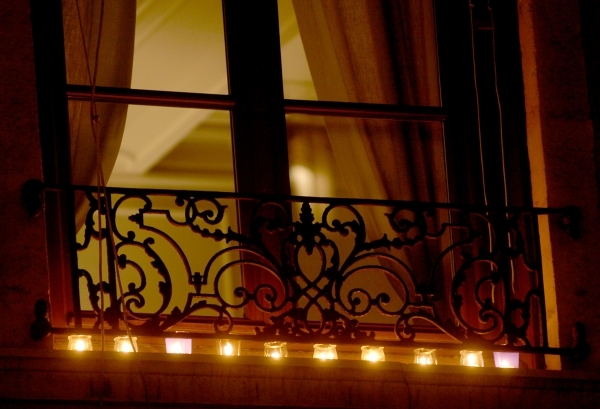 When night falls, the locals place lumignons on their window ledges. Throughout the festival, many masses are held in Lyon’s churches and particularly in Fourvière Basilica. While visitors are allowed inside the basilica, they are asked not to speak so as not to disturb the religious celebrations. Are the festivities free? Is it necessary to make a reservation? Shows put on as part of the Fête des Lumières are entirely free and are located throughout the city centre. Visitors are free to move around, so no reservation is needed to attend the event. Which are the best days to come to the event? The Saturday evening traditionally attracts the most visitors. The 8th of December is also a very popular evening, as it is the historical day of the festival. However, as this is an internationally renowned event, you can expect to see large crowds on all four evenings! Is there a particular direction or route recommended for visitors? Visitors are free to move around in the city. However, the programme always offers suggested routes in order to guide people who are unfamiliar with the city. Is it possible to be accompanied by a guide? The Bureau des Guides (Tour Guide Office), our official department in charge of group and private guided tours, can be contacted for any requests or information about visiting the city. To visit the city and its heritage during the day, or to be accompanied by a guide for the evening illuminations, please feel free to contact the Tour Guide Office on +33 (0)472 777 233 or at visit@lyon-france.com. Please note that due to large visitor numbers, it can be difficult to access the Vieux-Lyon (Old Lyon) district on the Saturday afternoon. When will the official programme be issued? The Fête des Lumières programme will be published in mid-November. You can find out about all of the shows and download the programme at the official Fête des Lumières website. Even though the shows are different each year, the idea behind the festival remains the same and its extent remains fairly similar from one year to the next. Please feel free to take a look at the information about last year’s festival to get an idea. The coach parking map is usually issued at the same time as the official programme, in mid-November. For 2018, coach parking areas will be located Quai Augagneur (banks of the Rhône river) and Quai Rambaud (banks of the Saône river). The parking is free and it is not possible to book it. For any other questions, please don’t hesitate to contact us on +33 (0)472 777 231 or through our contact form. We will be happy to send you our Fête des Lumières newsletter on request to keep you up to date with all the latest official announcements.